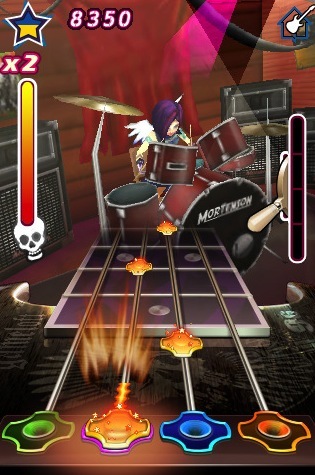 Gameloft's addictive Guitar Hero clone has a tendency to crash, and we don't mean on our couches. Activision whores Guitar Hero to almost every platform with the exception of PSP and most importantly, the iPhone. For whatever reason, the world's most popular music game has yet to grace Apple's portable wonder, but Gameloft's here to satisfy our rock and roll cravings with Guitar Rock Tour, a $9.99 clone that allows us to play two instruments while jamming to 17 cover songs. Now all the company has to do is prevent it from crashing like a bad singing career. If you played Guitar Hero or Rock Band, then you already know how this game works. Multicolored notes (in this case, green, purple, blue and orange) pour down the screen and you match them up with corresponding buttons along the bottom. Except instead of using a plastic guitar, you tap the frets with your fingers to hit successive notes and hold them down for longer ones. Build a combo and you'll activate Pyro Power, which lets you score more points for a limited time. Miss too many notes and your chosen musician gets booted from the stage. It's like a portable Guitar Hero World Tour. You can even play drums by pressing two buttons on opposite ends of the screen. By this point, after years of multicolored note games, it's hard to screw one up. That said, Guitar Rock Tour is an enjoyable clone with all the trimmings, right down to the bizarre characters like Justin Case (ha!) and Nick-Pik, as well as a great collection of music that includes such hits as Beat It, Message in a Bottle, Heart-Shaped Box and Rock You like a Hurricane. They're all covers (kind of lame, considering Rock Band 2 and Guitar Hero have master tracks), but Gameloft earns points for having good taste in music. Similar to the games it emulates, Guitar Rock Tour features a Quick Play and Tour Mode, the latter sending you on trips across the world to play at different venues and unlock songs. There's also a tutorial, "Justin Case" you need to learn the game's finer points. Playing takes some skill, since you'll need to tap the buttons without accidentally covering the iPhone's speakers. That said, we were surprised that the developers didn't include the option of jamming horizontally. Gameloft is usually great with options, so this is a glaring omission. We're also disappointed by the load times. Between songs is fine, but the initial loading takes too long. Guitar Rock Tour's biggest flaw, however, is its tendency to crash. Sometimes, the game will freeze and force us to reboot or kick us back to the iPhone's main screen. At first, we thought it was our phones because we drop them a lot, but then we saw complaints from other gamers and the issue was clear. Gameloft needs to patch this bad boy as soon as possible, lest consumers feel the sting of a $9.99 lemon. Otherwise, the game "rocks". 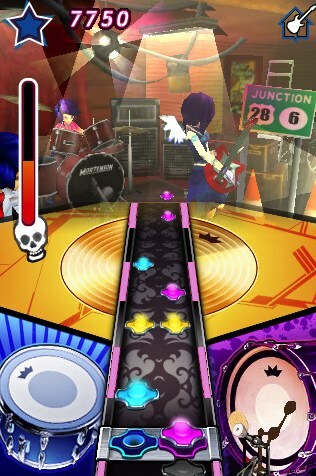 It has the same tried and true Guitar Hero mechanics fused with near PSP quality visuals. Sure, we'd rather play with plastic instruments, but Guitar Rock Tour satisfies our music fix while on the road. For now, though, save your cash until Gameloft updates the game. Ten bucks is too much to spend on such an unstable app, and we cannot raise the score until the company addresses the problem. What's Hot: Impressive soundtrack, Guitar Hero style controls, playing drums is fun times, rock inspired graphics, has a character named Alice Malice. What's Not: Crashes like an alcoholic musician, costs $9.99, difficult to play vertically without covering iPhone speakers, cover songs are so two years ago, initial loading takes too long.